Williamsport, PA - Have you heard this Bear Bryant quote, "Offense sells tickets, defense wins championships?" Is this the year that the Warrior defense re-emerges as the dominant team needed moving forward towards another MAC Championship? This Saturday's game will reveal a lot about the 2018 Lyco defense. 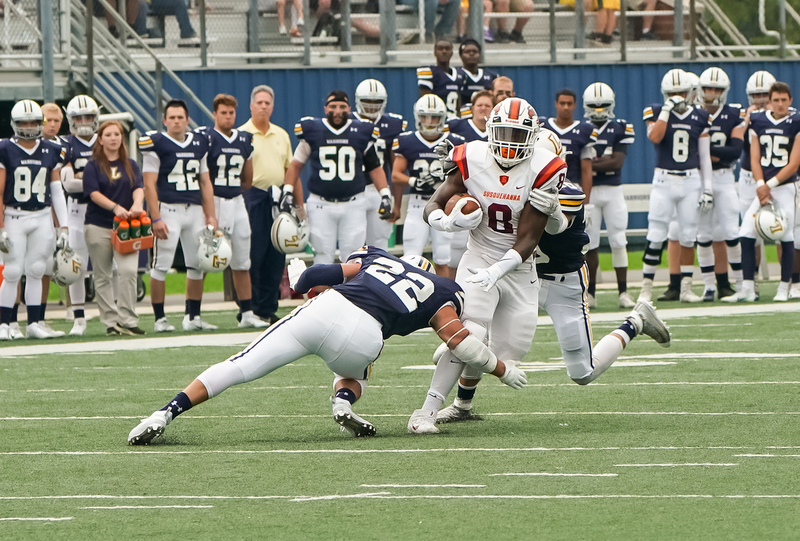 What coaches are looking for is consistency of the defensive team with field play similar to the Widener victory. The defense did have a wonderful game against the Pride. And the defensive backs are a big key to shutting down an offense especially in the red zone. Today's spotlight player is a defensive back who made some big noise against Lebanon Valley two years ago. This is the bio of that player Joe Pinzka. After two weeks of the 2018 season, Joe Pinzka is the leading tackler of the defensive backs. Joe has 6 solo and 4 assisted tackles for 10 tackles in those games. That average is 5 per game. Two years ago against Lebanon Valley, Joe made the game clinching interception. In 2017 he played in 10 games and started two as a defensive back. He was fifth on the team with 45 tackles and posted 26 stops on rushing plays. Then add to that two tackles for losses, a pass breakup, a forced fumble and fumble recovery against Widener where he made nine tackles. In 2016 he appeared in all 10 games and started three at defensive back. Joe had 33 tackles and a fumble recovery against Delaware Valley. Pinzka notched a game-clinching interception against Lebanon Valley. He then had a season-high six tackles against King’s and Stevenson. Pinzka was also a member of the MAC Academic Honor Roll. In 2015 Pinzka appeared in nine games and made one start as a defensive back. He was also a special teams player. On defense Joe made 11 tackles, eight of which were solo and posted season-high four tackles, three solo, against King’s. High School: A four-year letterwinner in football at Lansdale Catholic ... team captain ... a quarterback and defensive back ... rushed 88 times for 322 yards and seven touchdowns ... completed 50-of-95 passing for 713 yards and six touchdowns as a senior ... added four interceptions ... a first team all-league quarterback and defensive back ... team MVP.